We set out to find the UK’s Top Treehouse, and it’s safe to say that we found it in The Faraway Treehouse, Norwich. 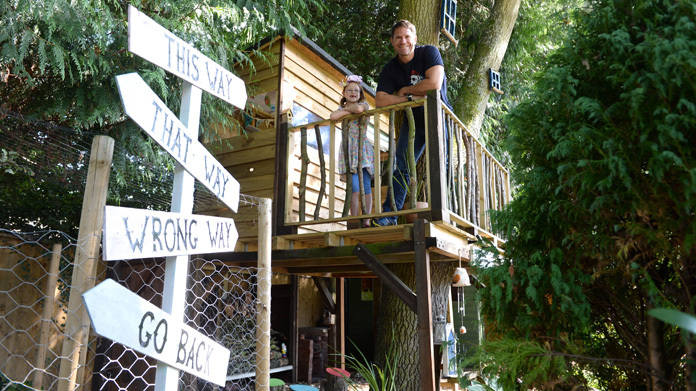 We recruited adventurer, Steve Backshall, to be our chief judge and announced a nationwide competition to find the best treehouse built by a family – along with research that told us kids today would rather a treehouse than a new games console. From the first announcement, through to releasing the shortlist of ten incredible builds and finally revealing the winner – the coverage has been flooding in. The story has appeared in the likes of Daily Express, Independent, Daily Mail (twice) and Daily Mirror. The broadcast interviews have also been coming thick and fast with our treehouse builders appearing on the likes of BBC Radio Norfolk, BBC Radio Yorkshire, Notts TV, ITV Anglia (twice), ITV Meridian, BBC East Midlands (twice) and Mustard TV. And to top it off – front page hits and full page spreads have been popping up around the country with our shortlisted entries appearing in the likes of East Anglian Daily Times, Norwich Evening News, Birmingham Mail, Manchester Evening News and plenty more – giving us over 90 regional hits from the local and regional titles. No mean feat.